Wide receiver Calvin Ridley agreed to terms on a rookie contract with the Atlanta Falcons, his agents SportsTrust Advisors announced on Wednesday. [post_ads]The deal is for four years with a team option on a fifth for Ridley, who was selected by the Falcons with the 26th overall pick of the 2018 NFL Draft. Atlanta has yet to announce the deal. 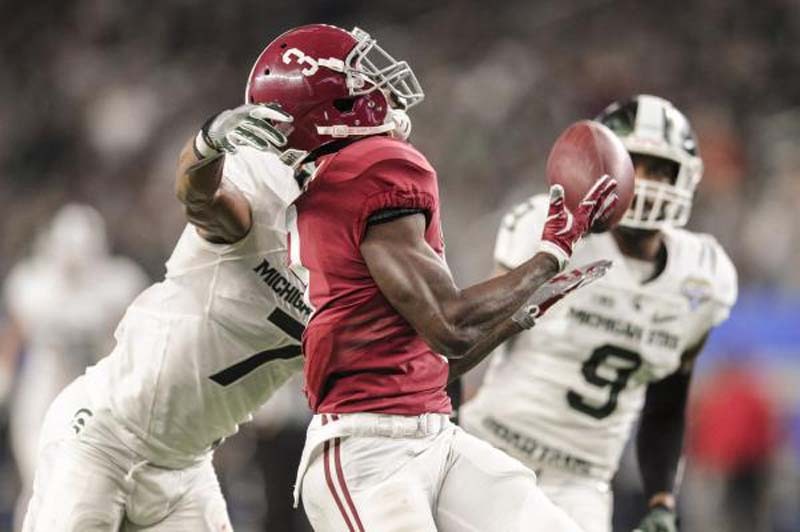 Ridley had 63 receptions for 967 yards and five touchdowns this past season with Alabama. The 6-foot-1, 190-pounder finished his career with the Crimson Tide with 224 catches for 2,781 yards and 19 scores. "We see him as a versatile receiver that can play inside and outside," Falcons head coach Dan Quinn said of the 23-year-old Ridley, per 247Sports. "He's fast, but he's highly agile and has the ability to stop and start well. He's got 19 touchdowns in his career. Again, he's a play-making type of guy. He's an explosive guy for us, and that's an important part. He's a guy that can beat man-to-man, and he has that type of quickness. Only a few guys have the speed that play outside and can change direction to play inside. So, he's really a quick guy. "You can tell he's been really well-coached, and is a rock solid guy. He's ready to contribute right away."